Did you know that only 30 minutes from Ikebukuro on the Tobu Tojo Line, you can reach the amazing historical area of Kawagoe? Not only can you improve your luck in love here at the Kawagoe Hikawa Shrine, but you can also enjoy sightseeing too! Summer means romance, but how can you improve your love life? 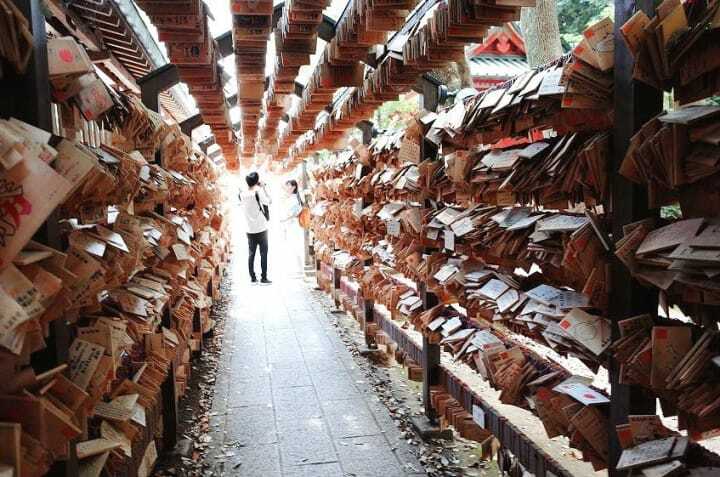 Well, it just so happens that there is a charming shrine in Kawagoe in Saitama prefecture where you can improve your luck in love! Not only that, but you can see, shop, and dine in an amazing Edo era townscape too - all just 30 minutes by train away from Tokyo! Let's Head Out To Kawagoe! First, I made my way to Ikebukuro Station and visited the Tobu Tojo Line ticket office, where I purchased a convenient ticket issued by Tobu Railways called the KAWAGOE DISCOUNT PASS. The KAWAGOE DISCOUNT PASS (700 yen for adults, 360 yen for children), or the KAWAGOE DISCOUNT PASS Premium (950 yen for adults, 480 yen for children), not only makes it easier to travel from Ikebukuro to Kawagoe, but also gives you special discounts at participating shops and restaurants, while the Premium Pass also allows you to ride the buses in the area for free as well. For more details, check out their official website. After hopping on the train, it only took 30 minutes to arrive at Kawagoe Station, and it was easy to see the history of this area - there were traces of it all through the city, right down to the manhole covers! The area around Kawagoe Station covers several different periods of Japanese history though, so in walking from the station, you will find yourself stepping backward through time. Before heading to the shrine, I decided to do some exploring. One of the first places you'll come to when you exit the station is Crea Mall, a shopping street with plenty of modern and slightly retro shops and restaurants serving everything from fast food to traditional Japanese fare. Then, further along, you will come to Taisho Roman Road, a charming little shopping street with shops and Japanese restaurants from the Taisho era (1912-1926), including doll maker's shops and sweets stores. But after about a 15-20 minute walk, depending on how long much exploring you do, you will come to the Kurazukuri, or Old Warehouse Area of Kawagoe, more commonly known as Koedo Kawagoe, or Little Edo Kawagoe. Here you will find rows upon rows of preserved Edo era buildings that have been turned into shops selling everything from wooden handicrafts, traditional sweets, and so much more. This is an incredible area to shop for authentic Japanese souvenirs! Not only are the buildings historical, but here and there throughout the city you'll find different decorations and traces of the past as well. It's a lot of fun to look around and check out the side streets here in Kawagoe. One shop that caught my eye was Fuyusha, a store specializing in items made from traditional Japanese fabrics. I couldn't resist picking up a pair of shoelaces made from chirimen (1080 yen with tax), a type of crepe silk often used in making kimonos and kimono accessories. And the helpful staff there recommended the small sparrow charm which is meant to bring good luck (320 yen with tax). Not too far away from this shop you will find the symbol of Kawagoe, the Toki no Kane, the Time Bell Tower, which was first built in the mid-1600s, and reconstructed several times over the years, with the current tower having been built in 1893. This tower is an incredible sight to see, and as it's surrounded by so many old buildings and the courtyard is quite quiet, you just might find yourself feeling as though you've stepped backward in time. It was at this point that I found myself getting hungry, so I decided to take advantage of one of the perks of my KAWAGOE DISCOUNT PASS Premium, and headed for Ryotei Yamaya, a 150 year old traditional Japanese style restaurant where those with this pass can enjoy an exclusive Japanese bento-style lunch, available in two different varieties. The staff of this ryotei were all so friendly and kind, but when my lunch arrived, I almost couldn't bear to eat it! Doesn't it look amazing? This is their Kagome box lunch (1620 yen with tax), which features different seasonal vegetables cooked in traditional Japanese manner, sashimi style squid, and many other delicacies. If you'd like to try the Kagome box lunch, please keep in mind that it's best to reserve on beforehand as the number of Kagome box lunches that can be provided without prior reservation in limited. Also, please be aware that this menu is available only on weekdays (from Monday to Friday). Here you can see the friendly owner, Mr. Jun Matsuyama, and one of the very hospitable staff of Ryotei Yamaya out front of the ryotei. Thank you so much! Business Time 11:30-21:30 (last order 19:30) *lunch only on Sundays and holidays. 13:00-14:00 -- More Exploring in Kurazukuri! After lunch, I headed outside and walked along a quiet backstreet until I came to Kashiya Yokocho, or Penny Candy Alley, as it's called in English. Here you'll find many small shops selling traditional Japanese sweets, especially those made with sweet potato, a specialty of the area. Along the main road, amid the souvenir shops, you can also find incredible treats, like at Kameya, a 230 year old confectionery store where you can purchase these, their famous Kame Monaka (572 yen with tax), a crisp wafer sandwich with sweet red bean paste inside. This pack of Kame Monaka contained sweets wrapped in red and white paper, a color combination that is considered auspicious in Japan. Please be aware that the regular packaging uses only white paper. With my souvenirs in tow, I decided to use my pass and hop on the Tobu Koedo Loop Bus to head to my main destination only a short drive away, Kawagoe Hikawa Shrine. A 1500 year old Shinto shrine, Kawagoe Hikawa Shrine is renowned throughout Japan for its match-making and romance powers. Here two wedded couples of Japanese gods are enshrined, which is why it has come to be known as a power spot for those looking for love or marital happiness. One way to find out more about your luck in love is to try fishing for an omikuji. Place 300 yen in the wooden box and pick up a small fishing rod, then try to catch one of the fish in the "tanks"! There are red, pink, and white fish to choose from; red are general fortunes, while white and pink tell your fortunes in love. I cast my line and managed to catch a pink fish, but my fortunes in love are a secret! I was fortunate enough to be visiting Hikawa Shrine during their annual furin (wind chime) festival, which meant that there were hundreds of colorful glass wind chimes with wooden prayer placards streaming from them throughout the shrine and its precincts. The sound of the chimes along with the sunny summer weather and cool breezes made this visit feel like something almost otherworldly. Those who are fortunate enough to visit Kawagoe Hikawa Shrine at about eight o'clock in the morning, can receive their very own enmusubi-tama, a special match-making stone only available to those who visit in the early morning hours, said to grant greater fortune and aid when it comes to finding your perfect match. Menu/Pamphlets in Other Languages English language luck divining strips (omikuji) available. I'll come back soon Kawagoe! After spending such a fulfilling day in Kawagoe, I was a little sad to head back to Ikebukuro, but when I arrived at the station, I found myself standing outside of the Tobu Department Store, so I just had to head in and see what they had to offer too. There are many fashion boutiques and shops to choose from here, plus great cafes serving a variety of dishes, and there was even a special summer event on the eighth floor, where you could purchase hundreds of different Japanese handicrafts - everything from hand-dyed scarves to carved wooden dishes and more. At Tobu Department Store, you can use their tax-free service, which allows you to purchase items at lower prices than usual. Moreover, what's great about this store is that the tax exemption procedures don't require a handling fee. This makes it all the more convenient to shop here. Lunch, souvenirs, etc: about 4000 yen for the whole day! Bonus Tip - Stay in Kawagoe! If you have the time in your schedule and budget, and want to fully immerse yourself in the atmosphere of Kawagoe or would like to get to Kawagoe Hikawa Shrine early in the morning to get your enmusubi-tama, then I recommend staying at the Kawagoe Tobu Hotel, which is only a 15 minute walk away from the Kurazukuri area. This way, you can see absolutely everything that Kawagoe has to offer and truly savor the historical atmosphere of the area. Supported by TOBU Railway Co., LTD.